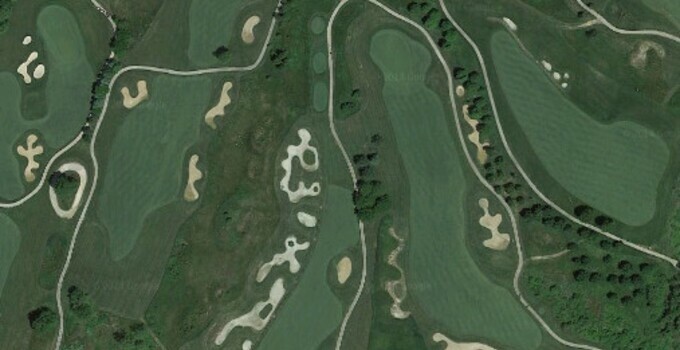 Welcome into Signature Holes, a new-ish feature here on the Billy Casper Digital Network where we look at the architecture behind some of the most interesting holes in the Billy Casper Golf portfolio. This week, we look at the tricky par-5 16th hole at PB Dye Golf Club in Ijamsville, Md. Standing on the tee box at the 16th is a strange feeling. If you look to your left, the hole seems kind of like a standard, long-ish par-4 fairway. If you look to the right and see the parallel hundreds of yards of bunkering and the distant green, it seems like an impossible task to make par. And that's what you fight when you play this hole: the desire to cut off distance in lieu of prudently pursuing par. So long as you don't pull your tee shot way left, or get in trouble right with a push or trying to bite off too much to find a tight safe spot, the tee shot isn't actually scary. What's scary is making a decision on where to lay up your ball because you're probably not getting home in two. The green is to the right of your eye and tucked well back in a narrow peninsula, guarded by bunkering and trees. You can lay up on the same side as your drive and leave a longer, trickier third shot over the sand, or try to blast it over and find some grass -- either on the green or short in a 40- to 50-yard area of mowed fairway. If the hole location is in the front of the green, a wedge in hand for your third should give a decent look at birdie. A back pin should make you more defensive, just looking to two-putt your way to a 5. Either way, avoiding the big number is more important here than thinking birdie or better, which makes this a fun and challenging hole.